Are you ever hungry for a snack that has your favorite treats wrapped into one package? I often times will open the pantry and feel conflicted over which item I should grab. After all, I don't want the other faves to feel badly. 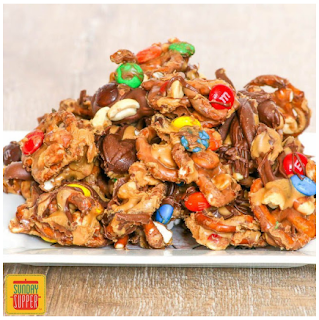 This Quick Chocolate Peanut Butter Pretzel Mix is the perfect solution. The perfect mix of sweet and salty, this chocolate peanut butter pretzel mix is created right in the pretzel bag. What could be easier? Set aside ⅓ cup (58 grams) of peanuts and ⅓ cup (78 grams) of M&M's. Mini pretzels are sold in bags larger than 9 ounces. Remove all but 9 ounces and enjoy the remaining pretzels another time. Add the remaining peanuts and M&M's to the bag of pretzels. Close the bag and shake until the pretzels, peanuts and M&M's are well mixed. Add the melted chocolate and peanut butter to the bag. Seal with a clip or wrap the edges closed and shake until everything is mixed together, using your hands to help manipulate the chocolate and peanut butter through the bag. Transfer the mixture to the prepared pan. Sprinkle the remaining peanuts and M&M's over the top. Place in the freezer to set, about 15 minutes. 0 Response to "Quick Chocolate Peanut Butter Pretzel Mix"